The attempt to market Eastern forms of mediation as “nondenominational” and as secular practices continues. 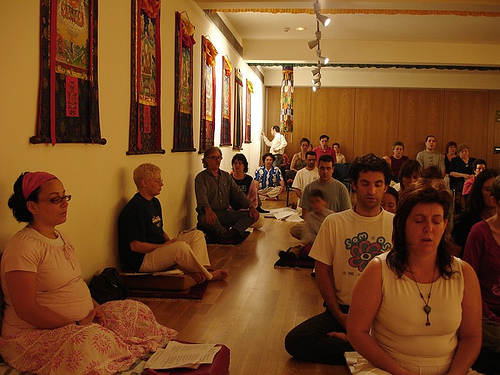 A recent Washington Post article from September 2, 2011 has a write-up on classes on meditation led by someone from a Buddhist group in Wash. DC, the Insight Meditation Community. The classes are offered in a Unitarian Universalist Church right outside DC in Bethesda, MD. It is a hallmark of Eastern meditation, especially Buddhist, to make thinking a sort of enemy. Buddhism is not against thinking per se but teaches that our thoughts and thinking prevent us from realizing spiritual truths and “awakening” to reality. Since Buddhism believes that the perceived reality of the material world and the self are false, Buddhism therefore believes that our thoughts come from these perceptions of the false reality (and create them). Therefore, the thoughts reflect and perpetuate false views. Sometimes, thinking is termed “monkey chatter” (also in Hinduism).